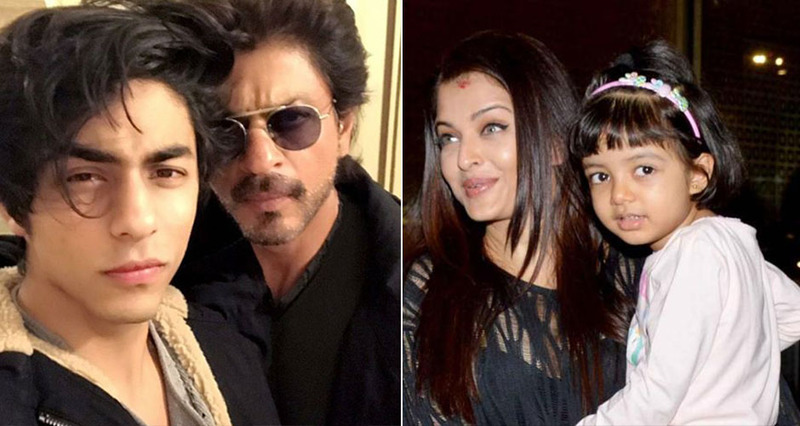 Celeb kids are genetically blessed as they have super talented parents. The media loves them, and with the growing influence of social media – celeb kids are more savvy at handling fame. With star kids making awesome debuts every year, we just can’t wait to see these kiddos in action soon! Aryan is already taller than SRK and has inherited all his good looks. SRK has never kept his kids protected from media glare – as he knows they have to carry on his legacy. Studying in London, he’s rumored to debut with YRF’s Dhoom 6. His dad has denied these speculations, but we just can’t wait to watch Aryan on the big screen. Both of Hrithik’s sons are already so good looking. And if your dad has the looks of a Greek god, and dances like a dream – you can bet that some of the talent would have been inherited by you as well. The little Roshans, Hrehaan and Hridaan – can be spotted on dad’s sets and on many holidays as well. We sure can’t wait to watch these two cuties grow up and take on the Roshan legacy! Aamir Khan’s son Junaid with his first wife Reena Dutt, is already a handsome young boy. Junaid has got the good boy looks from his dad. Aamir says that Junaid is his most honest critic. Junaid can always be seen at the premiers of his father’s films and also his movie sets. Do we have another Mr Perfectionist in the making? We think so!! Arbaaz Khan and Malaika Arora’s son Arhaan is all set to further the prospects of the Khan-daan with his super cute looks. Arbaaz Khan’s older son Arhaan is already 12 and so very handsome! We think it’s just a matter of time when the next generation of Khan brothers will be making their mark in Bollywood. Abhishek and Aishwarya Rai Bachchan’s daughter – Aradhya has been born into the most illustrious family of India. She sure has a lot of expectations on her young shoulders! From acting, literature to politics – all avenues are open for Aradhya. Here’s hoping we see her following in her dadi’s and mommy’s footsteps soon. Govinda was a successful actor of his times and his daughter is all set to make her big Bollywood debut. However, it’s Govinda’s son Yashwardhan – who’s the talk of the town. He was overweight, but now has become fit and sports a six pack. We are definitely waiting for junior Govinda to make his mark on the silver screen. Sunil Shetty’s son Aahan is quite a talented boy. An aspiring actor, following in the footsteps of his dad – he’s already learnt acting. He also shares a fondness for music and sings well. In fact Aahan is lead singer and guitarist for a band that plays to raise funds for charity. This lad, has his heart in the right place and all the skills needed to succeed in Bollywood. Aarav is super cute looking guy, who is the son of handsome Akshay Kumar and gorgeous Twinkle Khanna. Just like his father Aarav practices martial arts and also enjoys adventure sports! Twinkle has a flair for writing as well as the arts, and Aarav has also inherited this artistic side of his mom. He has a deep interest in painting. We sure hope he grows up fast as Bollywood’s waiting!! Sara is a beauty who takes after her mother Amrita Singh. Her father Saif Ali Khan has kept her away from the limelight. But ever since Sara was spotted in Saif Ali Khan’s wedding to Kareena Kapoor – she has been making waves in Bollywood. Sara also appeared on the cover page of Hello! Magazine alongside her mommy Amrita. Rumors are doing rounds that she has finally started accepting offers and may soon be seen in a movie! We sure can’t wait!! Did we miss any bright star kid? Tell us !! Did you know about these celeb kids and their interests? Share below!